Mary Oliver is an American poet born September 10, 1935. She attended both Vassar College and Ohio State University. She did not obtain a degree. A widely published poet, Oliver has numerous books to her credit, including American Primitive (1983) which was awarded the 1984 Pulitzer Prize. She has won numerous poetry awards and honors, placing her in the forefront of American letters. Oliver’s poems about nature are among her most popular. Regardless of subject matter, however, almost everything she writes is situational, philosophical, and quizzical. A master of metaphor, she explores nature in search of intellectual and emotional answers and encourages and inspires her readers to do the same. 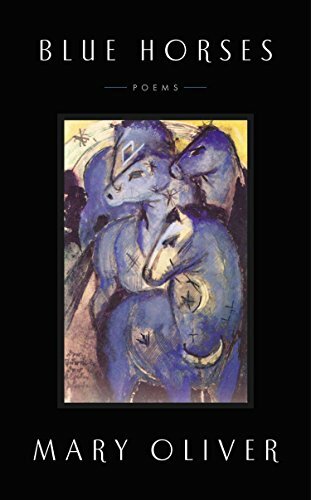 Blue Horses, Oliver’s most current volume and the subject of this review, takes its title from a painting by the artist, Franz Marc. Oliver’s poem “Blue Horses” proceeds in a transformative manner from the initial entry—a virtual stepping into—the painting, through a developing depth and resonance moving toward consummation, to a final cumulative knowing, a kind of ars poetica in which Ms. Oliver says of the horses: “I don’t expect them to speak, and they don’t./If being so beautiful isn’t enough, what/could they possibly say?” The poem is a transcendent ekphrastic experience, a paean to emotional connection and communication elevated to the status of aesthetic ideal. At every turn, Oliver offers challenges, encourages closer encounters, all of the forerunners of real learning—learning of an emotional as well as an intellectual nature. Oliver’s poems afford opportunities for working through a variety of experiences, the magical and the mundane, the exceptional and the day-to-day, punctuated sometimes by a sudden reach to the ultimate, the sublime. Yet Oliver, even as a young person, sang and sang her own song—as she yearned to be, against all odds, like Shelley. Clearly, she persisted. In order to sing your own song, you must go back to your beginnings, tap the memories, all the learning by watching, doing, meditating, experiencing—from the simple to the complex, and back again. Understand the value of Blue Horses, a collection that serves as a true manual of consciousness of the world around you—and an aesthetic guide to your place in it. This collection is rich in a multitude of examples of inter-connectedness with the world, identification with paintings, a variety of journeys culminating in revelation and aesthetic transcendence. It is important to note that, while this volume is a source of continuing inspiration for followers of Oliver, it does not break substantially new ground for the poet. That said, Blue Horses is a collection not necessarily to be broken down into constituent parts, but to be inculcated and appreciated for its seamless consistency, its wholeness and fullness of identifications and its examples of connectedness, a volume from Oliver to be visited and revisited—a lyric collection to be treasured.